MYIR is a third party partner of TI, welcome to use MYIR's TI products! 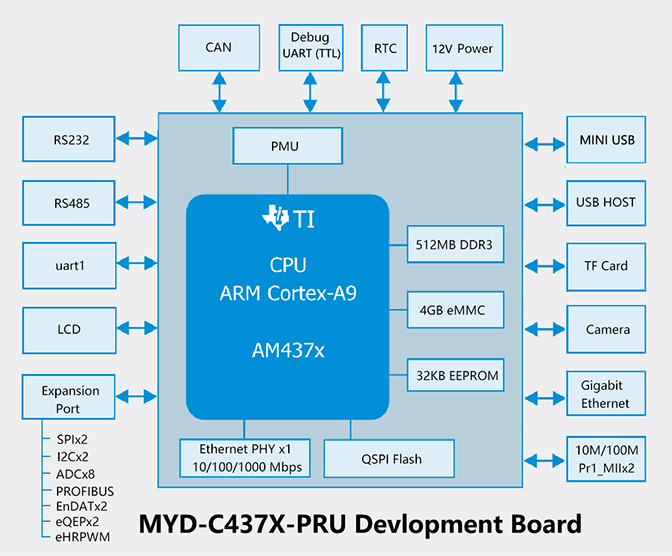 The MYD-C437X-PRU Development Board is a complete evaluation platform especially designed for users to take full advantages of the Programmable Real-time Unit (PRU) as well as the 3D graphics acceleration features from Texas Instruments (TI) Sitara AM437x ARM Cortex-A9 processors. It can support -40 to +85 Celsius extended temperature operation and is ideal for industrial communications, industrial control, and industrial drives applications. 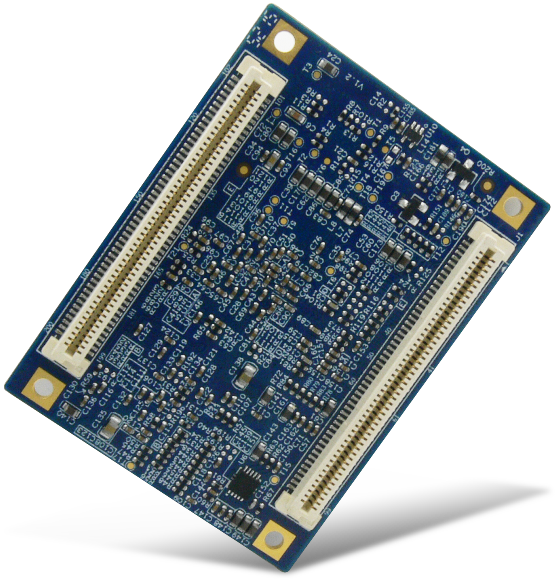 The MYD-C437X-PRU development board employs the MYC-C437X CPU Module as the core controller board which is mounted onto the MYD-C437X-PRU base board through two 0.8mm pitch 2*100-pin board-to-board connectors. The CPU Module has the core components AM437x processor, 512MB DDR3, 4GB eMMC flash, 32KB EEPROM, Ethernet PHY and PMIC integrated on board. 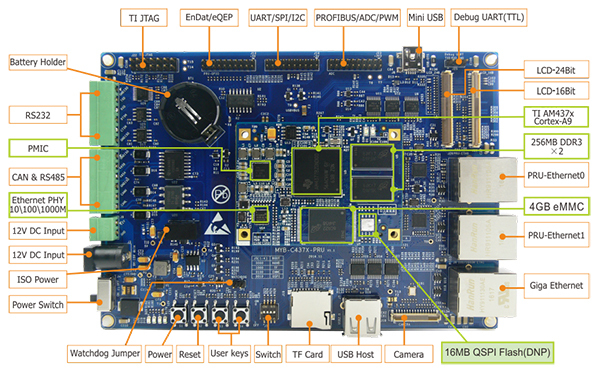 The base board has additionally extended a rich set of peripherals through headers and connectors from the SOM and some extended controller chips including three serial ports, one USB Host ports, one Mini USB Device port, one Gigabit Ethernet, two 10/100Mbps Ethernet ports from the PRU-ICSS subsystems, one CAN, one RS485, one Camera interface, one Micro SD, LCD, Touch screen and more others. The AM437x processor family consists of 4 pin-pin compatible devices (AM4376, AM4377, AM4378 and AM4379) with various options including speed grades, packages, graphics and peripherals. 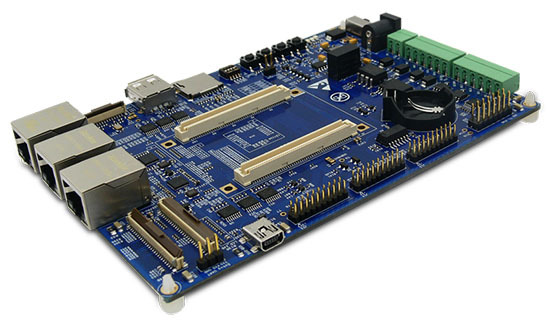 MYIR delivers the MYD-C437X-PRU board with AM4377 processor by default which is able to support EtherCAT through two PRU-ICSS Ethernet ports and run TI SYS/BIOS v6.45 Real-time Operating System. 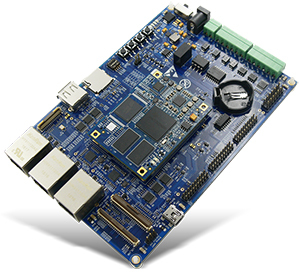 The MYD-C437X-PRU board comes with necessary cable accessories and a product disk containing the Linux 4.1.18 and TI RTOS (SYS/BIOS 6.45) software packages and detailed documents. The complete platform provides a quick AM437x starter kit for users when getting the goods out-of-the-box right away. * The LCD display function cannot be used with the EtherCAT function at the same time due to reused signals. * The LCD interface can be either selected to use the 16-bit LCD interface or 24-bit LCD interface. 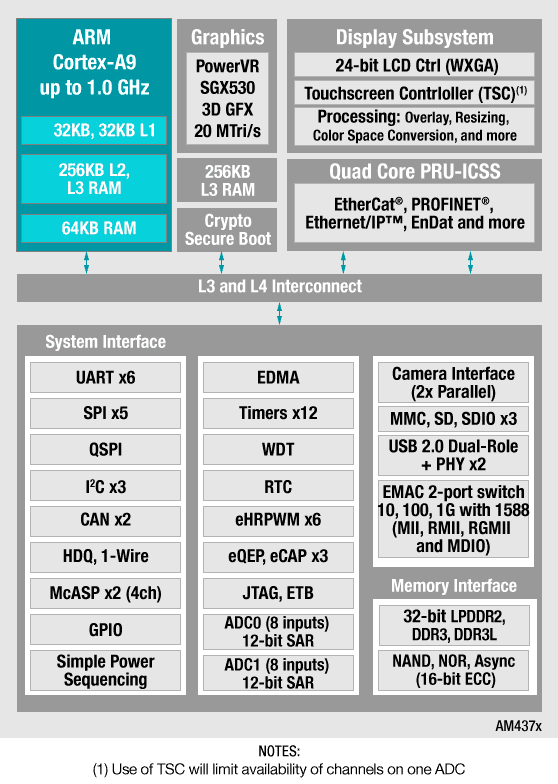 The TI AM437x high-performance processors are based on the ARM Cortex-A9 core. Customers using this next generation solution will see an increase in performance, as well as extensive reuse from the ARM Cortex-A8 offerings. A. Use of TSC will limit available ADC0 inputs. 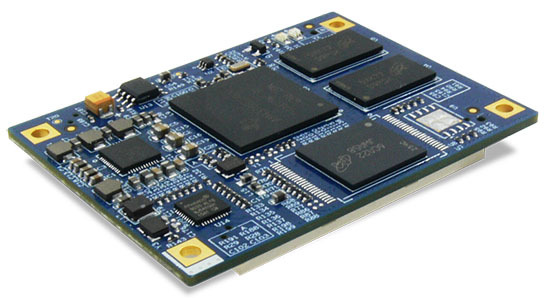 * PRU-ICSS is a programmable real-time core for industrial communication protocols. 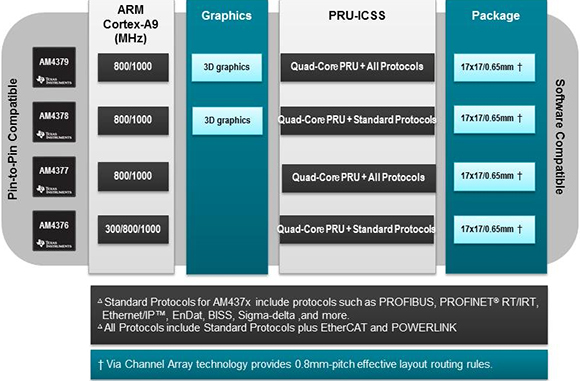 * Standard Protocols for AM437x processors include protocols such as Ethernet/IP, PROFINET™ RT/IRT, PROFIBUS™, Sercos III, EnDat, Sigma Delta and more. 1. 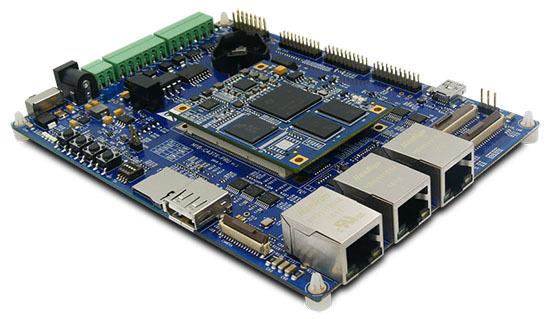 One MYD-C437X-PRU Development Board includes one CPU module MYC-C437X-PRU mounted on the base board by default. If you need more CPU module, you can order extra ones. 2. 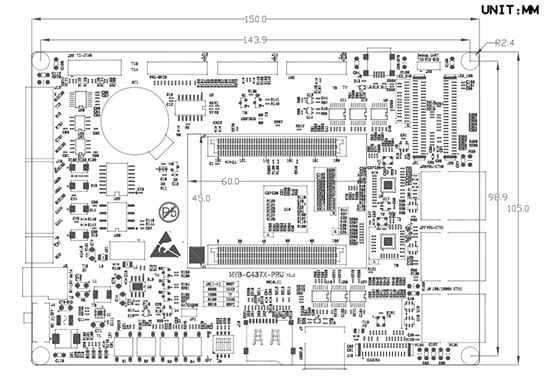 We accept custom design based on the MYD-C437X-PRU, whether reducing, adding or modifying the existing hardware according to customer’s requirement.